The TRIP2 provides EO/IR object tracking, geo location, video compression, IP encapsulation and video recording capabilities. EO/IR object tracking points the camera to track a subject within the camera’s range, ensuring the subject of interest never leaves the view. Geo location captures the position of the camera, its line of sight, and extracts location of observed objects with unprecedented accuracy. Video compression and IP encapsulation provides significantly low latency compression enabling long range operation. TRIP2 records high quality video with GPS metadata attached and keeps snapshots to a MicroSD card for simple access and expansion. 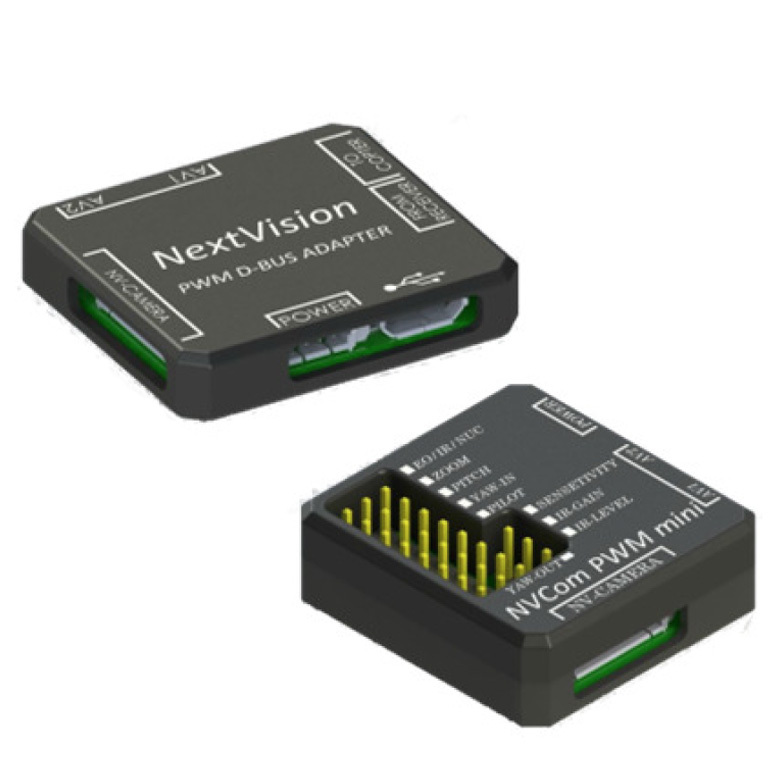 SBUS/PWM Adapter enables operators to control NextVision’s cameras using a remote control through PWM or S-Bus interface. SBUS/PWM Adapter perfectly fit radio control systems, such as those from Futaba,JR & Frsky, allowing for quick and simple integration with powerful controllers. The retraction feature enables camera operators to deploy and retracts cameras during operation, keeping cameras safe and protected when not in active use. Mounts and vibration dampers enable operators to mount NextVision cameras horizontally or vertically and isolate camera from platform vibrations, providing lightweight yet strong mounting solutions to ensure perfect stability.